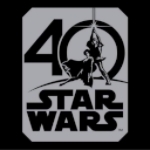 I'll be there, but will be walking on the Dark Side as B. Fett. So it looks like Scott and I are back on for this. The funeral is not until November 7th. Oh, bummer on no Halloween at Disney. I was jealous of that one! But not of the circumstances surrounding your trip down south of course. It will be good to see you and Scott. I have a T-shirt for him! And I've decided I'll tough it out and wear my TIE Pilot costume to this event. I tend not to like wearing it because I can hardly see through my welders lenses, and I have a lot of trouble speaking through my helmet. But I have a new voice amp so it would be fun to give that a test run. And if I remember, I'll stop by Radio Shack and see if they have an ear piece so I can hook up a small microphone to aide my hearing too. WHO WANTS TO CHIP IN FOR PIZZA? About 18 dollars per 18" pizza. 1 18" pizza feeds 3-4 adults. The other alternative is you all bring your own food or pick something up at Burger King next door. Please sound off if you want to chip in for pizza. Rough estimate is we'd each chip in about 5-6 dollars (depending on how many pizzas we get and how this all breaks down). ARRIVAL TIME: They are flexible, since they know we may be getting off of work and traveling to the museum. But for those of us who can make it early enough to be ready to go by 5:00, we can arrive as early as 4:15 or so in order to change in the conference room. HANDLER/PHOTOGRAPHER: If anyone has a friend they'd like to bring as a handler or photographer let me know. North said that would be fine. If you have friends with other kinds of costumes please feel free to get the word out and invite them along! I have to see how my schedule looks, but I *might* be able to attend for a few hours on Saturday. I don't know if anyone would want to join me on Saturday afternoon at all? To all of our Hiller Aviation museum volunteers, this is just a reminder that with the bay bridge closure; the 101, the 92, and even in some areas as far south as Palo Alto on the 280 are very congested and slow moving with awful traffic back-ups because everyone is using the Dumbarton and San Mateo Bridges. I witnessed the back ups on the 280 going south, and on the 92 going from the 280 to the 101 on Wed. Today Matt ran into very heavy traffic on his way to San Mateo. 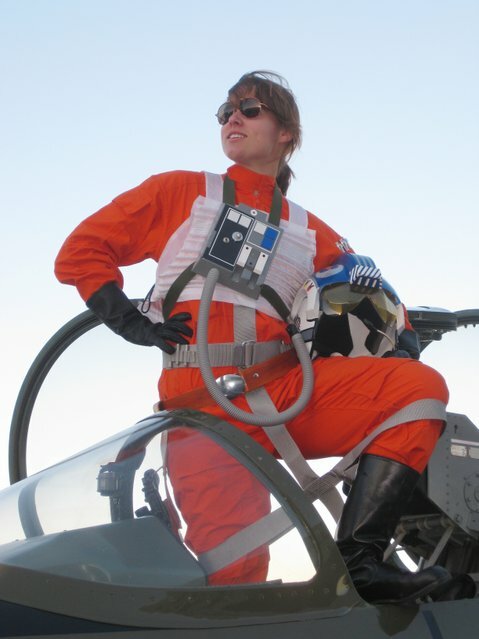 I just found out I can do this event so this Jedi will see you pilots tomorrow. 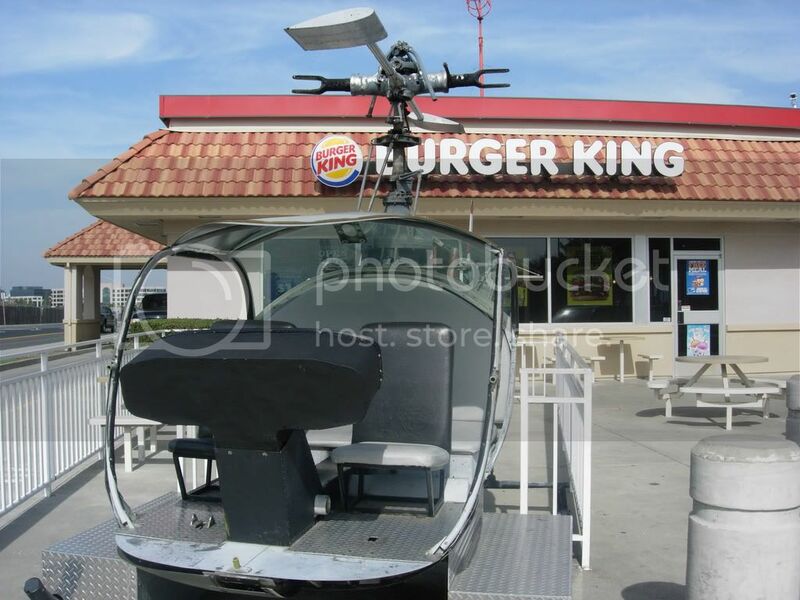 For those going to get food at Burger King nearby, you can't miss it - there's a helicopter in front of it! Great! Look forward to seeing you there. I'm going to see if I can make it to this. It's very tentative, since I won't know if I can leave work early enough until I'm actually leaving. No worries if you are on the later side Alison. The event goes until 8pm. Sorry I'm not going to make it to this after all. It's 6pm and I'm just leaving work now. With the heavy traffic, and having to change there, I'd probably have less than an hour before it closed. Hope you are all having fun! 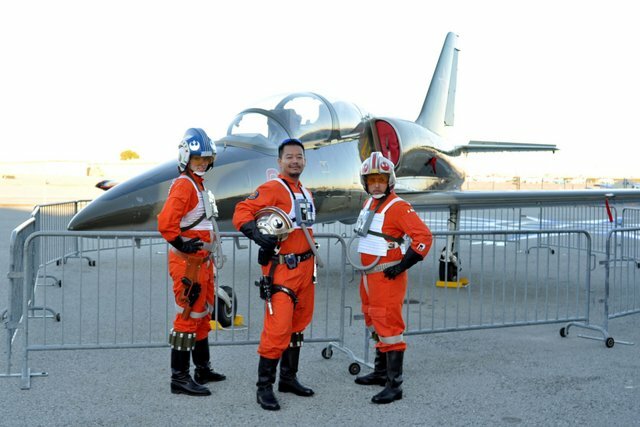 Event Summary: The Rebel Legion, 501st and San Francisco Fan Force were invited by Alex "Obi-Juan/Obi-Have" of the Rebel Legion and Mr. North West of the Hiller Aviation Museum to lend costume atmosphere to the annual community Halloween event in San Carlos, CA. 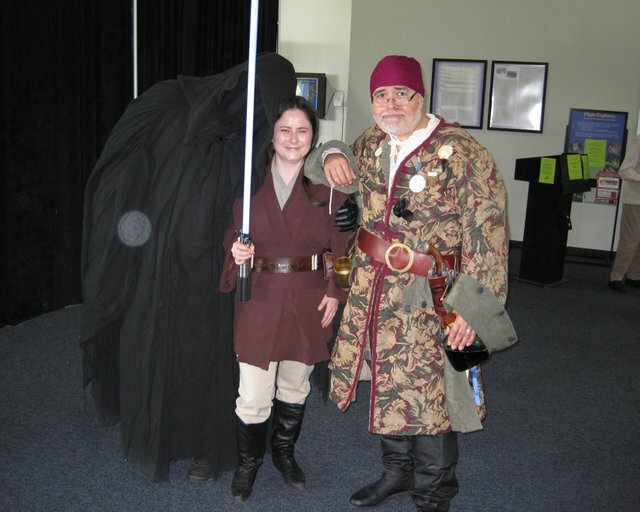 We were also joined by a few Lord of the Rings and Star Wars costumers from the Black Fleet. It was a fun family event with Halloween crafts for the kids and a pumpkin drop from a helicopter. RL/501st member "Trooperdad" was able to bring his sons Zach and Cooper along who dressed as a Biker Scout and Jawa. Thomas C brought an extra lightsaber and took action posed photos with the kids. The museum staff was thrilled to have us there, and as a special surprise they arranged for our Rebel and Imperial Pilots to climb into a genuine L-39 Albatross Jet! We were all treated very well and thanked many times by the staff at Hiller and the parents who brought their children to the event. On Saturday, Alison and Kathy returned as the victorious Rebels (Princess Leia and a Jedi), joined by a Ring Wraith, Boush, Mandalorian, and a few pirates from the Black Fleet. They even ran into a few young fans who remembered Jedi Taeriel from Pottery Barn! Thanks so much to all of the Rebel Legion, 501st, and San Francisco Fan Force members who came out to support the event on Friday and Saturday. Those are great pictures - especially inside the jet!